Before they reach their destination, the vessel is damaged by a "shock wave generated by a neutrino burst from a solar flare," whatever that pretentious, scientific jargon means. The upshot is that the accident conveniently dovetails with the arrival of mysterious radio signals that appear to be human in nature. Unfortunately, the intrepid explorers are blissfully unaware that they're being contaminated by a monstrous, microscopic virus that can enter a body through any open orifice. After a brief gestation period, the opportunistic infection drains the hosts of their vitality while simultaneously morphing into the drooling, gelatinous, man-eating creatures long associated with the Alien adventures. This doesn't bode well for the Covenant, and what ensues is a high burn-rate affair in which crew members are gradually picked off one-by-one, with each succumbing to a demise a little more grisly than the last. To paraphrase, the franchise's immortal, inaugural tagline: In space, no one can still hear you scream, or save you from a body-snatching chestburster either. 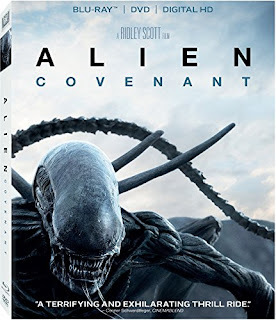 Blu-ray/DVD Combo Pack Extras: Audio commentary by Ridley Scott; a dozen deleted and extended scenes; Meet Walter; Phobos; The Last Supper; The Crossing; Advent; Master Class: Ridley Scott; theatrical trailers; and David’s illustrations.